THE BURIAL OF KOJO (L'ENTERREMENT DE KOJO) suit l'histoire d'Esi qui raconte son enfance et la relation tumultueuse entre son père Kojo et son oncle Kwabena. Après la disparition de Kojo dans une expédition minière illégale avec Kwabena, Esi se lance dans une aventure magique afin de sauver son père. THE BURIAL OF KOJO follows the story of Esi, as she recounts her childhood and the tumultuous relationship between her father, Kojo and her uncle, Kwabena. After Kojo goes missing on an illegal mining expedition with Kwabena, Esi embarks on a magical adventure to rescue her father. 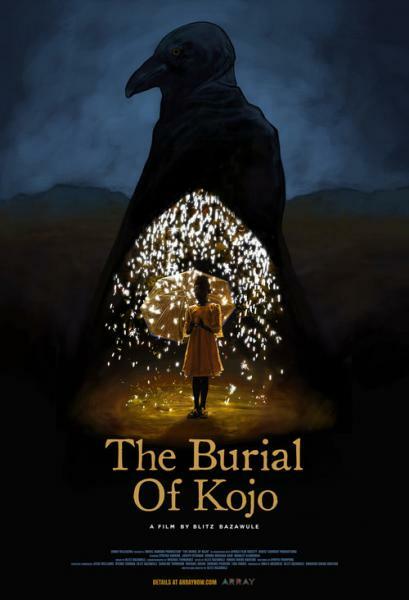 Through a magical realist lens, THE BURIAL OF KOJO follows the story of Esi, as she recounts her childhood and the tumultuous relationship between her father, Kojo and her uncle, Kwabena. Directed by TED fellow, music composer and musician Samuel "Blitz" Bazawule, the film chronicles the tale of two brothers through the gifted eyes of a young girl who transports the audience to the beautiful lands of Ghana and other worlds that exist between life and death. Born from a newspaper article and a Kickstarter campaign, Bazawule skillfully captures the beauty of a family, even when the circumstances aren't beautiful. THE BURIAL OF KOJO is an essential human story of courage and survival.